PAKISTAN, more than anyone else in the region, has cause to be worried over the Clinton administrations imposition of sanctions against Afghanistan. The cause for action was provided by the Taliban failure to respond to American suggestion that they hand over Osama bin Laden, the Islamist terrorist leader, to them. ISLAMABAD, July 24  Pakistan will not allow use of its territory for any action against Saudi dissident and alleged terrorist Osama bin Laden. SINGAPORE, July 24  India today received yet another shot in the arm in its continuous run on international diplomacy as the Foreign Ministers of the 10-member ASEAN grouping supported the principle of inviolability of the Line of Control in Jammu and Kashmir. ISLAMABAD, July 24  The proposal to set up a national security council has been revived following a growing feeling among ministerial circles here that lack of coordination and in-depth discussion had resulted in the Kargil debacle. LONDON, July 24  World leaders mourned the death of Moroccos King Hassan, with the US President, Mr Bill Clinton, calling his death a great loss for the West Asians. 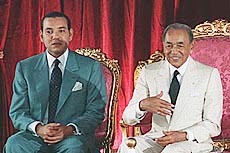 RABAT, July 24  Abuse of human rights cast a long shadow over the 38-year reign of Moroccos King Hassan II, who died yesterday. MIAMI, July 24  A US grand jury has indicted two Indian nationals and a Pakistani on charges of hijacking a Cuban government boat in Cuban waters, US prosecutors have said. NEW YORK, July 24  The founder of a spiritual practice that claims 100 million followers in China said he feared extradition from the USA and death at the hands of the Chinese Government, which rounded up thousands of his followers this week. PRISTINA, July 24  Fourteen Serb farmers were shot dead in a field in Kosovo last night, the NATO-led peace force said today. PAKISTAN, more than anyone else in the region, has cause to be worried over the Clinton administrations imposition of sanctions against the Taliban-ruled Afghanistan. The cause for action was provided by the Taliban failure to respond to American suggestion that they hand over the Saudi millionaire, Osama bin Laden, the Islamist terrorist leader, to them. Or that the Taliban force him to move out of his Afghan haven to some more accessible place or alternatively, to let the USA know about his exact location in Afghanistan. Osama bin Laden is one of the 10 most wanted terrorists by the USA and has been directly accused of having mastermind the attacks on US diplomatic missions in East Africa. The Americans have placed a $5 million price tag on Osamas head. The USA did indeed try to liquidate Osama when they mounted a missile attack on his Afghan hideout last year. While the camp did suffer heavy damage Osama remained unharmed. What has added to the American ire against Osama are his repeated threats to America and Americans, having on several occasions asked Islamists that it is the duty of every true Muslim to kill Americans. Pakistan comes into the picture on two counts: First, it has been directly involved in foisting the Taliban on Afghanistan, with the Inter-Service Intelligence agency of Pakistan playing a key role in stabilising the Taliban hold on the country. Second, its well known to the Americans, as well as the rest of the world, that the Markaz-e-Dawalirshad and its offspring, the Lashkar-e-Toiba, have been hand in glove with the ISI and the Taliban. The Markaz, operating from a sprawling campus made available to it by the Government of Pakistan on the outskirts of Lahore, has for the past several years been recruiting Muslim teenagers from within the country and from places as far away as Sudan, the Philippines, Bangladesh, Egypt, Libya and Afghanistan, indoctrinating them with heavy doses of religious teaching and then moving them on to for military training with the Lashkar-e-Toiba and at Osama bin Ladens camps. The ones trained at Bin Ladens camps have turned out to be the most committed and better trained of the militants, many of whom have since moved into Kashmir. Those who have been to the Markez campus, near Lahore, are overawed by the level of indoctrination the young Muslims trainees are subjected to. Sacrifice in the name of Islam, they are told, is the only way to find Allahs favour. Jihad is the shortest cut to Islamic salvation. The rest of the training at the Lashkar-e-Toiba and Osama bin Laden camps, say those with first hand knowledge, make the youth putty in the hands of their commanders. And Pakistan cannot claim that it doesnt know what the Markaz is doing. Some of the highest civil and military dignitaries of the country have been visiting the Markaz on a regular basis. The ISI too has drawn men from its ranks to undertake tasks on its behalf. The Americans cannot be unaware of the close links between the Markaz, Osama bin Laden and the ISI. Having worked in close concert with the ISI during the days of the Afghanistan conflict, following the collapse of the Soviet Union and even before that, the Americans have every reason to know how the weaponry made available by them and the Saudis to the Afghan freedom fighters engaged in anti-Soviet operations, has found its way into the hands of Taliban, Lashkar and Harkatul Mujahideen. The last named was declared a terrorist organisation, under its previous nomenclature of Harkatul Ansar by Washington. The Americans are said to be aware of this as also the fact that most of the so-called Kashmir freedom fighters in Kargil and Rajouri and Doda come from the ranks of the Lashkar and Harkatul Mujahideen. ISLAMABAD, July 24 (AFP)  Pakistan will not allow use of its territory for any action against Saudi dissident and alleged terrorist Osama bin Laden, reports today quoted Interior Minister Chaudhry Shujaat Hussain as saying. Mr Hussain said Pakistan was not involved in any operations for the arrest of Laden from his sanctuary in neighbouring Afghanistan, The Nation reported. His remarks followed a flurry of unconfirmed reports in the local press that American commandos were in Pakistan for an operation to detain the alleged terrorist after Afghanistans ruling Taliban militia spurned the USA demands to expel him. Several religious groups in Pakistan have voiced fears the USA which last year attacked suspected Laden terrorist camps in Afghanistan with cruise missiles, was ready to carry out similar raids. Mr Hussain, denying the presence of American commandos in the country, said Pakistan had nothing to do with the issue of extraditing Laden. "This is a matter between the USA and Afghanistan," the minister said, adding Pakistan would not "allow (use) of its land for any action against Osama bin Laden." Mr Hussain dismissed as "totally baseless" claims by some religious leaders alleging a deal was struck over Laden during Prime Minister Nawaz Sharifs July 4 talks with President Bill Clinton in Washington. WASHINGTON, July 24 (PTI)  Panun Kashmir, an organisation of Kashmiri Pandits, has demanded that India launch police action against militants inside Pakistan as Islambad has failed to control the terrorists operating from its soil. Islamabads failure to control these Mujahideen under its jurisdiction has given India the right to launch a police action in self-defence to destroy the terrorist hideouts and training camps set up inside Pakistan, Panun Kashmir Convenor Dr Agnisekhar, and its US Coordinator Anil Kaul said. Short of such action by India, Pakistans India policy, in view of her internal compulsions, cannot be expected to take a pragmatic turn, they said, accusing the Centre and the Jammu and Kashmir governments of failing to prevent the recent massacres by Islamabad-backed militants in the state. Panum Kashmir believes that Pakistan has lost control over her borders with India. Consequently, they are being used regularly by terrorists, fundamentalists and Islamic mercenaries for infiltrating and spreading death and destruction in India, they said here. The two leaders demanded the carving out of a union territory from Jammu and Kashmir for Hindus which they said would prevent indiscriminate killing of the community in the state. They thanked the US administration, especially President Bill Clinton and Secretary of State Madeleine Albright, for publicly rejecting terrorist activities in Kashmir. ISLAMABAD, July 24 (PTI)  Pakistans largest religious party Jamaat-e-Islami, backed by most opposition parties including former Prime Minister Benazir Bhuttos Pakistan Peoples Party (PPP), will hold a rally in Lahore tomorrow in protest against the governments treacherous pullout from Kargil. Dubbed as the million march, the rally is the first attempt to mobilise public opinion against the governments Kargil fiasco and kick off a real movement against the Nawaz Sharif regime by assembling over a million people on the streets tomorrow, a Jamaat-e-Islami spokesman said. The rally is an attempt to display the peoples real anger over Prime Minister Nawaz Sharifs Washington accord with US President Bill Clinton which led to withdrawal of the Mujahideen from Kargil. Closed-door meetings between leaders of the Jamaat-e-Islami and opposition parties, such as the President of the multi-party alliance, the Pakistan Awami Ittehad (PAI), Nawabzada Nasrullah Khan, have already been held and opposition parties have directed their workers to join the rally, the media reports said. Similarly, other opposition parties like Farooq Legharis Millat Party, Imran Khans Tehreek-e-Insaf and other religious groups like the Jamaat Ulema-e-Islam have also pledged their support for the rally. ISLAMABAD, July 24 (UNI)  The proposal to set up a national security council has been revived following a growing feeling among ministerial circles here that lack of coordination and in-depth discussion had resulted in the Kargil debacle. The setting up of the council will minimise the Prime Ministers responsibility on important issues like Kargil. All decisions on such vital issues will be taken collectively by the council. Prime Minister Nawaz Sharif is being criticised by PPP leader Benazir Bhutto and other political opponents for the decisions taken by him in Kargil. Certain ministers are expected to broach with the Pakistan Prime Minister soon the idea which when first mooted by former Pakistani Chief of Army Staff Gen Jehangir Karamat had raised many eyebrows. Former federal minister and prominent PML leader Begum Abida Hussain had revived the idea during the Kargil discussion in the legislature. It found acceptance with Mr Ejaz-ul Haq, son of late Gen Zia-ul Haq, along with others from the ruling PML and no dissenting voices were raised during discussion in the House. Even a few ministers in Mr Sharifs Cabinet are not averse to the proposal. "There is no harm in having a forum where highly sensitive defence and strategic matters of prime national importance could be discussed." one of them said. "It was proved beyond doubt that there was a lack of coordination and in-depth deliberations were missing among different organisations before and after the eruption of the dangerous situation in Kargil," said another minister. SINGAPORE, July 24 (UNI)  India today received yet another shot in the arm in its continuous run on international diplomacy as the Foreign Ministers of the 10-member ASEAN grouping supported the principle of inviolability of the Line of Control (LoC) in Jammu and Kashmir and called for bilateral dialogue between India and Pakistan to resolve the dispute. A joint communiqué issued at the end of the two-day ASEAN ministerial meeting said: "We welcome the agreement reached by India and Pakistan to end hostilities along the Line of Control and urge both sides to resolve the dispute through dialogue." External Affairs Minister Jaswant Singh, who arrived here this morning to attend the ASEAN Regional Forum (ARF) meeting, which gets underway tomorrow evening, said the ASEAN statement had upheld the sanctity of the LoC, endorsing the Indian stand. He said this years meeting of the ASEAN Foreign Ministers also did not refer to India by name on the issue of non-proliferation as they did last year in Manila after the Pokhran tests. Asked to comment on Pakistan Foreign Minister Sartaz Azizs reported statement that trust was lacking in the 52-year-old history of India-Pakistan relations, he said he was disappointed by his remarks and asked angrily: "What did we sign in Simla in 1972? If this was not a document based on trust, what was it?" About whether the Lahore bus journey by Prime Minister Atal Behari Vajpayee was a mistake, the External Affairs Minister said "Let us not reduce India-Pakistan relations to the level of a school debating society. Lahore was a process towards correcting the mistakes of previous years." He said the whole world now recognised Pakistans misadventure in Kargil. "The world stood up because of the Lahore initiative by India", he added. Mr Jaswant Singh said: "India is a power that acts with restraint and responsibly. This has worked immensely to our advantage." Asked about resumption of dialogue with Pakistan, he said: "We are the initiators of the dialogue. We do not stand in the way of a dialogue." About his meeting with US Secretary of State Madeleine Albright tomorrow, the External Affairs Minister said a variety of subjects would come up for discussion and India had welcomed the US approach on terrorism. LONDON, July 24 (Reuters)  World leaders mourned the death of Moroccos King Hassan, with the US President, Mr Bill Clinton, calling his death a great loss for the West Asians. The Arab worlds longest-ruling leader died of a heart attack, at the age of 70, shortly after being admitted to hospital in Moroccan capital Rabat with Pneumonia. The Palestinian President, Mr Yasser Arafat, decreed a three-day mourning period in the Gaza Strip and West Bank. Mr Clinton expressed his condolences to the Kings son and successor, Crown Prince Sidi Mohammed, said Michael Hammer, a spokesman for the US National Security Council. Another former Israeli Prime Minister, Mr Shimon Peres, a personal friend of the King, said: He was pushing and promoting peace in the West Asia in any manner he could. With his passing we lose one of the most experienced and wisest leaders that this region has enjoyed in the last half century. A report from the United Nations said the UN Secretary-General, Mr Kofi Annan, called Moroccos King Hassan a leader who brought his people into the modern age and provided stability and prosperity to a turbulent region. RABAT: Hundreds of Moroccans took to the streets chanting Allah-u-Akbar (God is great) in a public display of grief at the loss of King Hassan. O Hassan, we are ready to redeem you with our soul and blood, they cried. Many wept openly and some fainted as the crowd marched from the royal palace to King Hassan avenue in central Rabat. CINCINNATI, (OHIO): Mr Bill Clinton and his wife, Hillary, will on Sunday attend the funeral of King Hassan, the White House said. White House spokesman Joe Lockhart said on Friday that Mr Clinton would meet the new King of Morocco and probably meet other world leaders gathering in Rabat for the funeral. RABAT, July 24 (AFP)  Abuse of human rights cast a long shadow over the 38-year reign of Moroccos King Hassan II, who died yesterday. Though matters improved under the combined pressure of the USA, the European Union and human rights groups in the wake of the fall of the Berlin Wall, questions over the murkier aspects of Moroccos past remain to be answered. An absolute monarch, Hassan had at his command a pitiless machinery of repression to combat political opposition, which did not shrink at summary executions, kidnapping abroad and imprisoning under the harshest of conditions. While he was still Crown Prince in 1959, Hassan observed how his father Mohamed V had a revolt by Berbers in the Rif region put down and in the first 10-year of his reign his security was assured by the ruthless interior minister, General Mohamed Oufkir. In 1965 Opposition leader Mehdi Ben Barka was kidnapped in Paris, probably with the complicity of senior French officials, and presumably killed though his body was never found. The same year Hassan declared a state of emergency, ruling until 1970 without even the semblance of opposition. In the two years following he survived two attempted military coups, whose perpetrators paid dire penalties. The officers directly involved in the 1971 coup was immediately shot, while Oufkir committed suicide following his arrest in 1972. MIAMI, July 24 (Reuters)  A US grand jury has indicted two Indian nationals and a Pakistani on charges of hijacking a Cuban government boat in Cuban waters, US prosecutors have said. Gurpreet Singh, Baljeet Singh and Mohammad Shevaz Chaudhry, who are seeking political asylum in the United States of America, were charged with conspiracy to hijack an international vessel, hijacking an international vessel and violence against the crew, the Miami US Attorneys office said in a statement. Prosecutors said the defendants hired Cuban nationals Roberto Lima-Cutino and first mate Jesus Serantes-Garcia in Cuba for a day of fishing and left Hemingway Marina in Havana on July 9 aboard the fishing boat born free. which belonged to the Cuban government. Within the territorial waters of Cuba the defendants attacked the crew, beating the first mate with a club and stabbing him with a broken bottle, prosecutors said. They took control of the boat and set a course for Miami, but the vessels engine quit in rough seas. They radioed for help from a passing sailboat, prosecutors said. When the US Coast Guard reached the boat adrift in the Florida straits 64 km south of Key West, Florida on July 10, the five men on board were injured, prosecutors said. They were taken to Key West for treatment. Prosecutors said the Singhs, from India, and Chaudhry, from Pakistan, faced 20 years in prison on each count. Their ages and hometowns were not immediately available. NEW YORK, July 24 (Reuters)  The founder of a spiritual practice that claims 100 million followers in China said he feared extradition from the USA and death at the hands of the Chinese Government, which rounded up thousands of his followers this week. Mr Li Hongzhi, who has lived in New York for about a year and a half, said the practice of Falun Gong posed no threat to Beijings Communist rule because it had nothing to do with politics. I just want to live a peaceful life. But recently I heard the Chinese Government wants to extradite me, Mr Li said in an interview. Asked why he thought China might want to bring him back, he responded with a bladelike hand motion across his throat. Probably to kill me, the 47-year-old former Grain Bureau clerk said. China banned Falun Gong on Thursday, saying it was an illegal organisation that cheated people and threatened social chaos. People engaging in Falun Gong activities in public or disseminating Falun Gong books would be jailed, state media said. Thousands of practitioners have been rounded up in China since Tuesday as they tried to stage peaceful demonstrations in 30 cities against the detention of 100 Falun Gong leaders, witnesses and a human rights group said. Practitioners of the discipline, referred to as Falun Dafa in the USA, say it cultivates mind and body through meditation and exercise. The practice has attracted many older people in China  grandparents, uncles and aunts in a society with deep family ties  who have shocked the party by their willingness to protest in public. PRISTINA, July 24 (Reuters)  Fourteen Serb farmers were shot dead in a field in Kosovo last night, the NATO-led peace force said today. It was the bloodiest single incident in the Serbian province since the KFOR peacekeepers arrived in mid-June to restore security after the withdrawal of the Yugoslav military and police forces. KFORs main problem has been ethnic Albanian revenge attacks on Serbs. KFOR spokesman Jan Joosten said British troops were patrolling near the town of Lipljan after dark at 9.30 local time yesterday when they heard shooting. Half an hour later, they found the bodies of 13 Serbs who had been shot dead next to their combine harvester. The body of a 14th Serb was discovered 150 metres away on a tractor, Major Joosten told Reuters. He said the murders occurred on a rough farm track about 1 km from the village of Gracko. British soldiers sealed off the area and the bodies were removed to a Pristina hospital. The British military police was investigating.